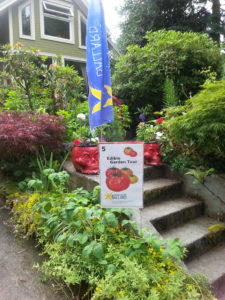 Central Ballard will be the area featured in the upcoming 2019 Edible Garden Tour. This is a fun walking / biking tour of neighborhood gardens, planting strips, containers, raised beds, chickens, and all sorts of creative edibles from fruit trees to berries to veggies galore. This is the 10th Edible Garden Tour we’ll be hosting and we’re excited to be back after a year off! Save the date and plan to spend a day walking or biking through central Ballard to discover how some of your neighbors raise urban fruits and vegetables. Gardeners will be on hand to answer your questions. Central Ballard gardeners … we’re looking for edible gardens big and small! Show off your containers, chickens, bees, goats, fruit & nut trees, berries, raised beds, aquaculture, kiwi vines, vertical gardens, permaculture – any style of food production. If you have an edible garden in the central part of Ballard — between 15th & 24th Avenues NW, and between NW 57th & 75th Streets — let us know! Interested? Contact Jenny to join the tour!